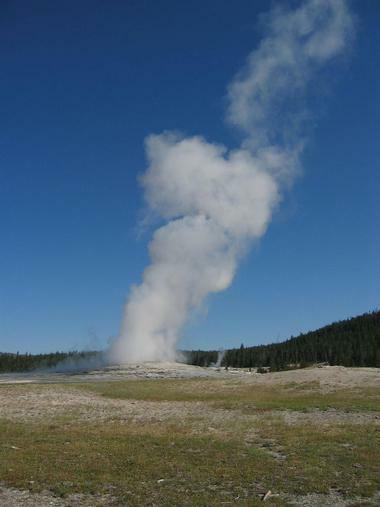 The Old Faithful Geyser is one of the most famous attractions in the U.S. Almost every visitor to Yellowstone National Park comes to see it erupt. If you are looking for summer family vacation ideas, Yellowstone should be at the top of your list. 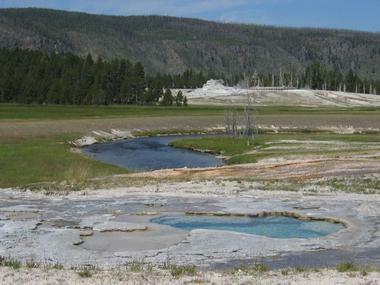 It is located in the Upper Geyser Basin which is home to the majority of the world's active geysers. It received its name because of its frequent and regular eruptions. The interval between eruptions varies from 45 to 120 minutes. Each eruption lasts 1.5 to 5 minutes during which boiling water is shot up to 180 feet into the air. While we stayed at the historic inn, we observed several incredible eruptions, which varied greatly in height. While most visitors come primarily to see this famous attractions, there are numerous other beautiful geysers just steps away. The area features an elaborate system of boardwalks which allow visitors to admire geothermal features from a safe distance. During the peak season from June to August, the area is saturated with tour buses and cars. Everybody stops at the inn to see its impressive 7-storey lobby, shop at the gift shop, check on eruption predictions and eat lunch. In the summer, be sure to wear sunscreen, a hat and drink plenty of water. Wildlife frequents the area, attracted by the warmth of thermal features during the cold nights. It is important to keep a safe distance and follow all ranger warnings to make your vacation a safe one. Geyser Hill, located in the Upper Geyser Basin in Yellowstone National Park, features several active geysers and colorful thermal pools. A scenic boardwalk leads up from the Old Faithful to Geyser Hill. If you are staying overnight, a walk up here is a must. 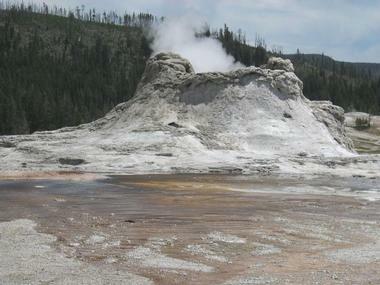 Along the way, you will witness many exciting eruptions, colorful pools of water and scenic views of the historic inn. Attractions include Anemone, Beehive, Lion Group and the Heart Spring. Four geysers, known as the Lion Group, include Little Cub, Lioness, Big Cub, and Lion. The group received its name from the roaring sounds that announces an eruption. Lion, which has the largest cone, erupts up to 80 feet high for up to 7 minutes. The Lion Group is set on top of the hill overlooking Firehole River. Anemone Geyser, located just steps from the Old Faithful Geyser, erupts every 7-15 minutes. If you don't have time to see any other attractions in the area, walk to this charming little feature and witness an eruption. 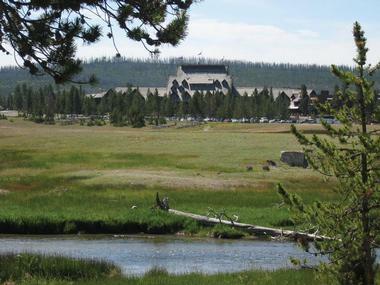 You will also get a nice view of the Old Faithful Inn. During a typical cycle, water begins to fill the pool. As it overflows, large bubbles rise to the surface, followed by a 10-foot eruption. The water then drains back into the vent and the cycle repeats. When active, Beehive Geyser draws a large audience because of the height of its eruptions which reach from 130 to 180 feet. The featurer is named for its 4-foot high cone which resembles a beehive. This is one of the most powerful geysers in Yellowstone because the cone acts as a nozzle which directs a column of stream and water up to 200 feet in the air. It can be dormant for long periods. When it is active, it erupts once or twice per day for about 5 minutes. Stop at the Old Faithful visitor center for current activity predictions. Blue in the middle, the pool has a colorful rim where heat-loving microorganisms have found their home. 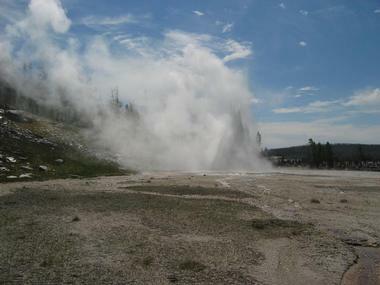 The scenery is breathtaking and sometimes Castle Geyser can be seen erupting in the background. When Castle Geyser is erupting, it is one of the more distinguishing features of the Upper Geyser Basin landscape in Yellowstone National Park. 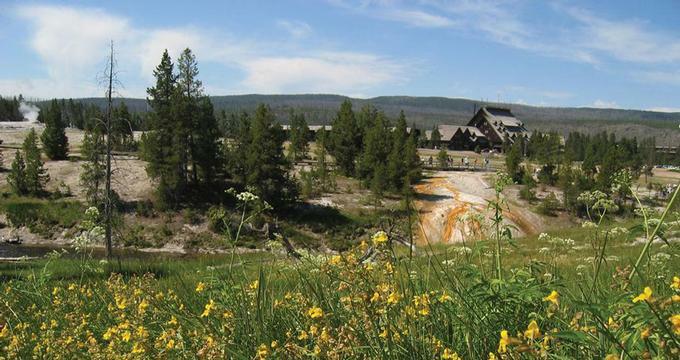 If you follow the boardwalk from Old Faithful up to the Chromatic and Beauty Pools, this attraction is situated across the Firehole River. It erupts every 11 to 13 hours and reaches 75 feet in height. The eruption lasts about 20 minutes. The large cone means that it's very old. Thousands of years of scalding water has deposited silica in a heaping pile. By comparison, the Old Faithful is only a few hundred years old. The geothermal feature has dramatically changed its surroundings by flooding the area with hot, silica-rich water. It erupts twice per day. Grand Geyser is the tallest predictable geyser in the world and was without a doubt one of the highlights of our trip to Yellowstone. It erupts up to 200 feet high for 9-12 minutes. 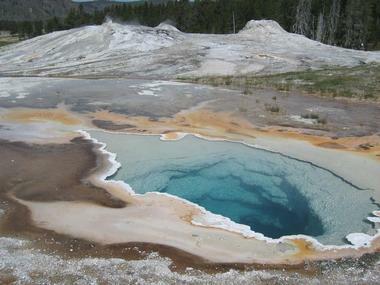 Before each eruption, the pools fill with water and people usually start to gather on the benches facing the geyser. You can also get the predictions for upcoming eruptions at the visitor center. 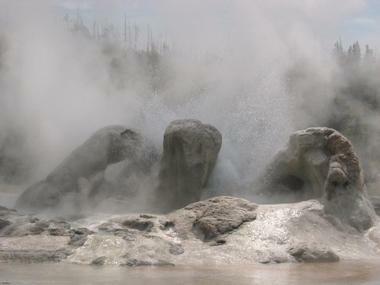 This is a classic fountain geyser that erupts with powerful bursts, usually between 1 and 4 during an eruption. When we were there, people started to leave after the first burst and came running back as the second burst followed. The Grotto Geyser in Yellowstone erupts in about seven-hour intervals 10 feet into the air. The eruption lasts from 1.5 to more than 10 hours! 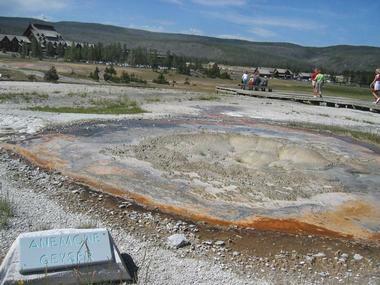 This is one of the oldest erupting geysers, featuring thousands of years worth of deposits. The surrounding area is flooded with scorching water which is constantly changing the surrounding landscape. 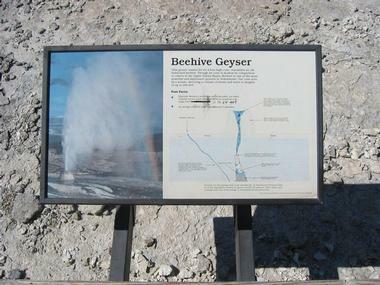 The feature is located in the Upper Geyser Basin. The surrounding landscape is quite surreal, with a lot of "smoke" and water. As you stroll on the boardwalk of the Upper Geyser Basin in Yellowstone from the Old Faithful Geyser to the Biscuit Basin, Firehole River follows along, contributing to the surreal scenery of this area with its erupting geysers, steam rising from hot pools and beautiful views. Riverside Geyser, set on the banks of the river, erupts 75 feet high every six hours. One a sunny day, a rainbow can be spotted in the spray of.